C'mon! Admit it. We know you've been waiting for this. You've probably browsed through the Discgolfreview discussion board for news about it and perhaps even already ordered yourself a piece as a fundraiser. So the time is finally ripe - We're putting out the PD2 on 24th of January simultaneously on both sides of the Atlantic. Though you should probably wait for a couple of days so your local retailer gets a chance to stock up. What needs to be said about the PD2 is that it's not for everyone. With the speed 12, glide 4, turn 0 and fade 4, Chaos is really aimed for the strong-armed touring pro. It's a disc that performs reliably in pretty much all conditions but it also requires strength for it to function the way it is designed. Basically this thing is a bulldozer ready to rumble, you just need to add enough torque. The first batch of the Chaos will be released in P-line, which is a bit more human stability-wise than the C-line version, which will be released later this spring. The P-line plastic is very grippy and it's ability to wear down works great with this disc. A P-line Chaos is the type of disc that you'll probably keep in your bag until you lose it or somehow punch a hole to it. So go on - hit up your favorite e-tailer or pay your local disc golf shop a visit and take the PD2 for a spin. We're pretty sure you'll love it. We certainly do! Everybody needs a little bit of Chaos in their lives. Ps. 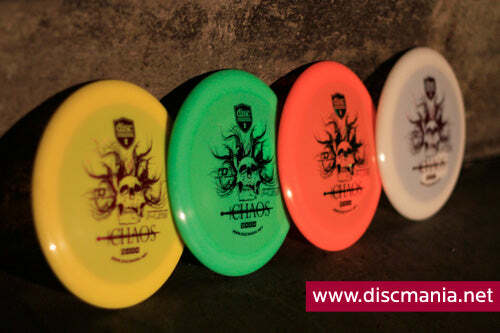 If your local disc golf shop doesn't already have any PD2's in their inventory, make sure to request them to add it! Sharing is caring!